Aqua-Rite In-ground Salt Systems. Automatically Turns Ordinary Table Salt Into a Self-Renewing Supply of Fresh, Pure Chlorine, Naturally! 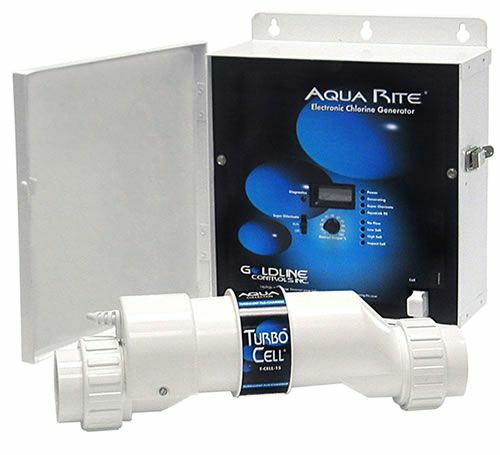 The AquaRite Salt Chlorine Generator naturally purifies your pool or spa water, automatically. AquaRite and ordinary salt naturally produce chlorine - the most trusted and effective pool sanitizer available, without the negative effects traditionally associated with chlorine. In fact, your water will be so safe and pure you can practically drink it. The AquaRite System is perfect for all for all plaster, pebble, vinyl and fiberglass pools up to 40,000 gallons. Merodynamic Pools Installs Salt Generator Systems throughout Atlanta Metro Georgia.